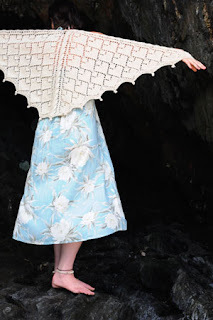 Today's sale pattern is the Petrel Shawl. This beautiful lace shawl begins at the center top edge with a provisional cast on. A few rows are worked in the cable panel. Stitches are picked up along the side of the cable panel, then the provisional stitches are picked up. 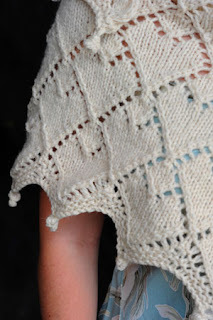 Stitches are increased along each outer edge, and along the center cable panel to shape the shawl. Short rows are worked to complete each point at the lower edge of the shawl. Stiches are cast on then bound off for the knots at the point of each tip. 14 sts = 3¾" [9.5 cm] and 16 rows = 4" [10 cm] in Cable and Lace Pattern after blocking. Take time to save time, check your gauge.